I am about to start a counselling Supervision course and with me looking for a new supervisor, I thought it would be a good opportunity to reflect on what is counselling supervision and what is it that I am looking for. I do not see my counselling supervisor as a manager or someone who critiques my work but I see them as a mentor. They provide guidance and information, are my emotional support and assist me to reflect on my practice and my professional identity. After each session I have with a client, I will reflect on each session. Occasionally I take my reflections to my supervisor which ensures my counselling sessions continues to be effective. Challenging my beliefs, values and how I am in the relationship enables me to be client-led and remain professional at all times. Reflection on the counselling tools I use helps me examine my own performance and skills. This in turn helps me improve the relationship with my clients and the counselling tools that I use. Reflection of myself helps me know my own thoughts and feelings and understand my role as a counsellor. This in turn develops and improves my relationship with my clients. Client work that I take to my supervision is always anonymous and I always destroy any notes that I have made after the supervision session. A few times I am challenged by ethical dilemmas. By taking this to supervision, I am able to discuss it through ensuring that I maintain professional standards and that all my decisions are based entirely on the principles of the BACP Ethical Framework. Working solely has many advantages but it does have some disadvantages. It can be lonely and you do not have colleagues to discuss work load. Therefore supervision helps me manage my work load appropriately and ensures that I do not become burnt out or too involved in my client’s work. Supervision is one of my support systems that I have in place enabling me to focus on the challenges I am faced with (as well as celebrate my successes). It also helps share any burdens that can occur when working with sensitive client material. What do you need in a supervisor? As you can see from the above, supervision enables me to stay grounded and ensures I remain an ethical competent practitioner. 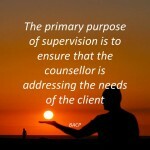 Picking a supervisor is similar to a client finding a counsellor. You need to have someone that you can connect with and one that you can trust. A supervisor who supports you and believes in you is paramount. Also it needs someone who is happy and relaxed to confront difficult issues with you. Lastly it needs someone you be yourself and can bring laughter into the room.